Both dental plans and dental insurance can help you save money on dental treatments. How each does it is very different, but the end result is the same, you pay less. ** Type in a zip code to get started. ** Type in a zip code to get started. 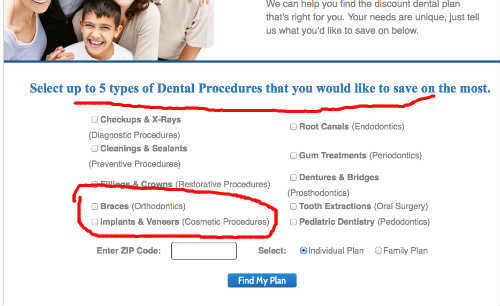 Click the button that says "Dental Insurance" and go straight to their dental options. The good news is if you're in the market for either a dental plan or dental insurance (learn the difference between dental plans and dental insurance here) you have many companies and individual products to choose from. But that also creates a problem. With so many choices, it can get complicated choosing one. Plan names, company logos, and price points intentionally blurred and removed. 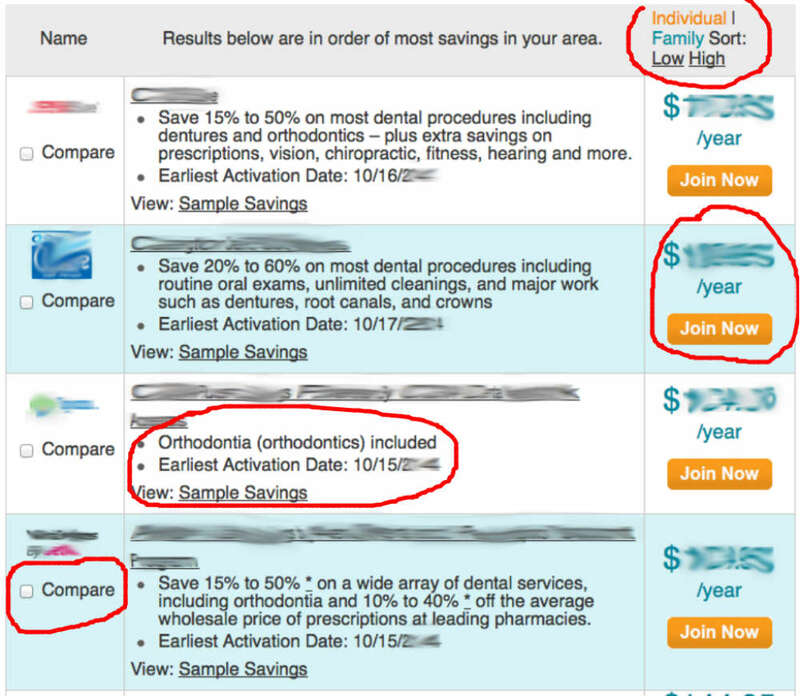 You can easily and quickly search, research, and compare dental plans. You have a number of convenient options to search for and zero in on a plan that's right for you. For instance, search by zip code, by your dentist's name, OR by the procedure you want like veneers, implants, or braces! You can also choose from 100,000+ participating provider listings in combined networks. The most dentist listings in combined networks anywhere! They're available if you need additional support. You get a 30-day Satisfaction Guarantee. They often have special promotions for new members, although this can change at any time. All you need to get started is a zip code. You're immediately taken to the plan results page. From here it's very simple to look at individual or family plans by clicking the links, and narrow your search. You can compare a number of plans at the same time. The "Earliest Activation Date" is clearly listed. What I also find convenient for comparison and research purposes is they allow you to see your potential savings. For instance, you'll get a list of sample procedures, the regular cost, and how much you can expect to save by purchasing the plan. Once you've made your selection, Join. Since it is not insurance, buying a plan is very simple. No paperwork hassles, no health restrictions, no annual limits, start saving immediately, join instantly, quick activation. It's hard to find anything that I didn't like about their comparing service, because it's simple and straightforward. I think the ability to search by procedure can save you a lot of time and help you pin-point the plans that offer what you want, in your area. You can even use their site to help you find other services like vision care plans, hearing care, chiropractic, and even LASIK eye procedures. > > Visit and shop DentalPlans.com now to save 10% to 60% on most dental procedures you want. Researching dental insurance policies individually or comparing them to others is a piece of cake with eHealthInsurance. They've helped over 4 million Americans buy insurance and have experience making the whole process as smooth and simple as possible. We've used eHealthInsurance many times in the past for research and buying insurance. If you run into problems and have questions you can chat with a live support agent 24/7. You don't need to give up any personal information like name, address, or phone number to comparison shop and research policies. Although, they do ask for birth date since the premium is often affected by your age. All information you input at this stage can be amended or corrected when you're ready to apply online. Make sure to click on their "Dental Insurance" button to get to their dental insurance search page. You can sort how the available insurance plans are listed. You're immediately taken to a screen that has all your available options based on the information you provided. While you're on this screen you can quickly compare two or more plans side-by-side by checking the "Compare" box. You can quickly jump in and get more details on each plan by clicking on the "Details" button under each plan. You'll see the monthly premium clearly. And you can search the each plan's current network of dentists. When you're ready to apply and buy insurance, just click the "Apply" button and fill out their application online. It was difficult to find something I didn't like. To find and research dental and health insurance plans, eHealthInsurance.com makes a complicated process very simple. The only thing I'd like to see is allowing you to search by dental procedure. However, I don't even know if this even possible since they sell insurance, and insurance tends to be overly regulated. But it could be a convenient feature. Along with individual and family dental insurance you can use this site to compare and buy group dental for your business. They also make it easy to buy health insurance, travel insurance, critical care insurance, vision insurance, life insurance, even pet insurance?! They have a number of short videos that give you additional information about the terms found in insurance policies like what is co-pay, what is coinsurance, what's a deductible. A Dental Savings Plan or Dental Insurance? It depends on your personal circumstances, your budget, the procedure you need, where you live, and even which dentist you choose to work with. Then, when you've narrowed down your choices to one or two each (companies/plans), compare the plans and insurance side-by-side, then choose the one that meets your needs best. You can own both a dental savings plan AND dental insurance at the same time. 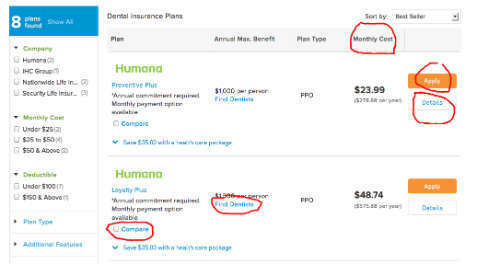 Granted, you'll pay more to own both, but depending on what procedure you want, and the dentist you're working with, it's possible that the discount dental plan saves you money on a procedure, while the insurance pays for the balance; or vice-versa. If you pencil out the numbers ahead of time, you could come out ahead.